“PPP believes in democratic dispensation and will be part of parliament process. We will try to convince other opposition parties to come to parliament and take up this issue over there,” said Bilawal reaffirming his commitment to take oath and take up the issue in parliament. The PPP chairman also said that it was the ECP’s constitutional duty to hold free and fair elections but it has miserably failed to do so, hence the ECP chief must tender his resignation. 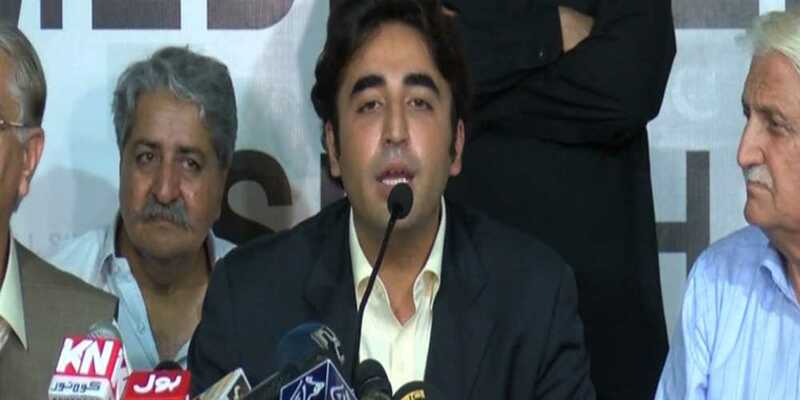 “There is no moral ground for the chief election commissioner to retain his position, he must resign”, demanded Bilawal. He also said his party will form a fact finding committee to look into the rigging incidents, complaints and then pursue the issue. Meanwhile, he also claimed that the recent polls have surpassed all past records of rigging which is not tolerable to the democratic forces in the country. “It was a colossal rigging in the history of Pakistan”, said the PPP chief, adding that the party has never levelled such allegations or rejected poll results in the past but the current situation leaves no other option. It is pertinent to mention here that the Bhutto scion who contested from three constituencies across Pakistan, managed to win only one seat with an upset loss at PPP home turf NA-246 Lyari, where he stood third in the total vote count. Responding to questions regarding being contacted by the Pakistan Tehreek-e-Insaf and Pakistan Muslim League-Nawaz, he said “It’s our principle to stand and our party today has decided that we will play a strong opposition role in parliament”. Similarly, regarding absence from the All Parties Conference which was held earlier today by the PML-N and JUI-F in Islamabad over contentious election results, he said, “We could not attend the APC because of our own meeting today, but we will contact them to reconsider their decision to not take oath”. Earlier, Bilawal and his father PPP co-chairman Asif Ali Zardari presided over a meeting which was attended by senior leadership from all provinces and decided to continue the parliamentary process and take all issues at proper forums as prescribed under the constitution. Former opposition leader Khursheed Shah, Aitzaz Ahsan, Farooq H Naek, Naveed Qamar, Syed Qaim Ali Shah, Qamar Zaman Kaira, Farhatullah Babar, Sherry Rehman, Yousaf Raza Gilani and Nayyar Bukhari were among others who attended the meeting.